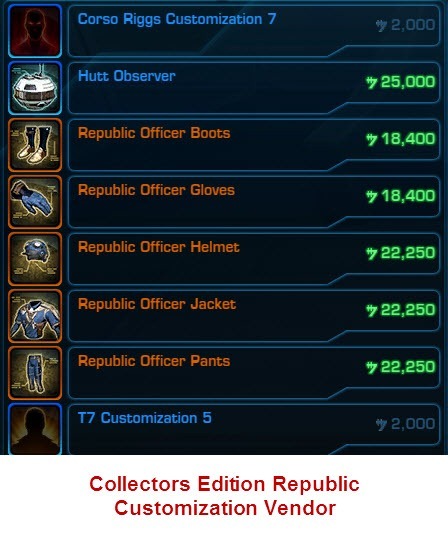 Big thank you, without you this would not be complete! 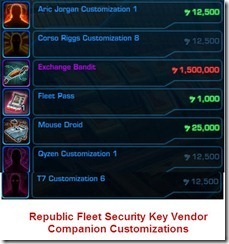 Beware that there are quite a bit of misinformation on the internet – I personally verified all of the findings here, including the CE and Security Key Vendor. 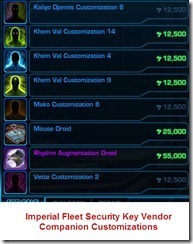 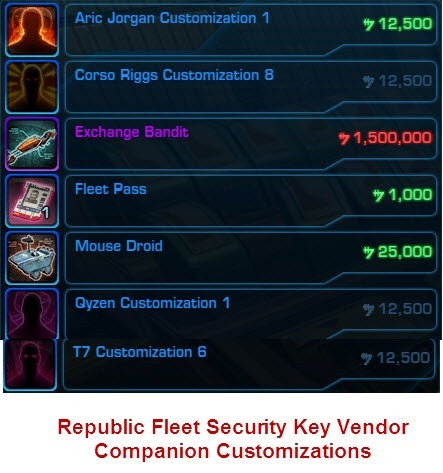 Fleet – Security Key Vendor – in the big circle around the cantina. 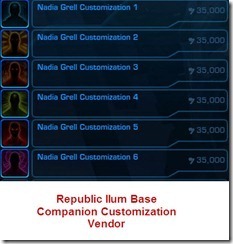 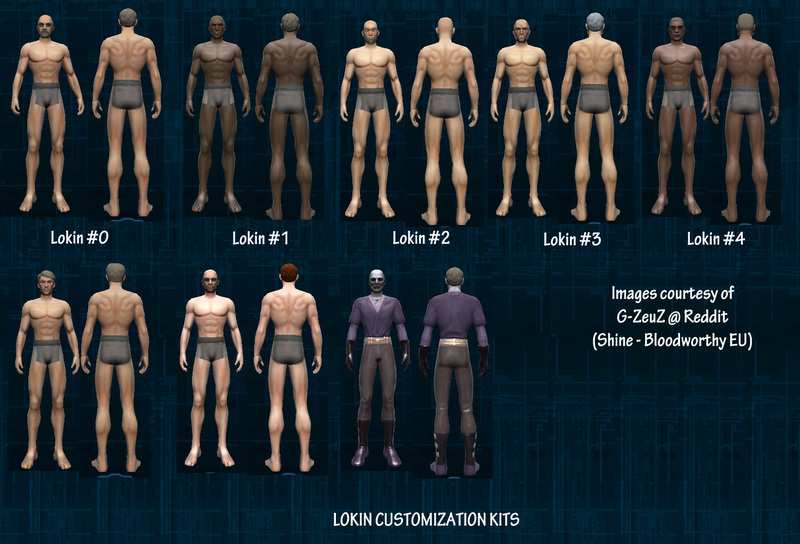 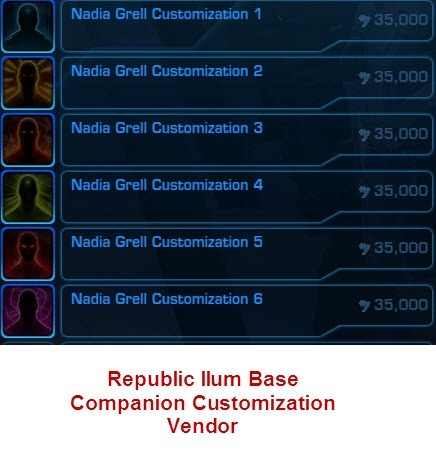 N/A – not available in game – possibility on the Ilum customization vendor (not the one on the orbital station) who has an empty inventory atm. 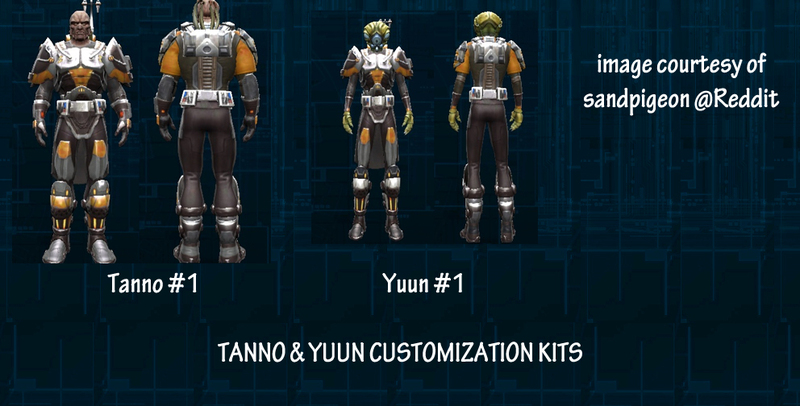 Dumb me i thought the customizations came with that gear look for Ashara and alex 🙁 .. i love those gears look , were can i find those? 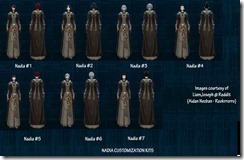 Sorry this was posted ages ago, I have no idea what they were wearing at the time. 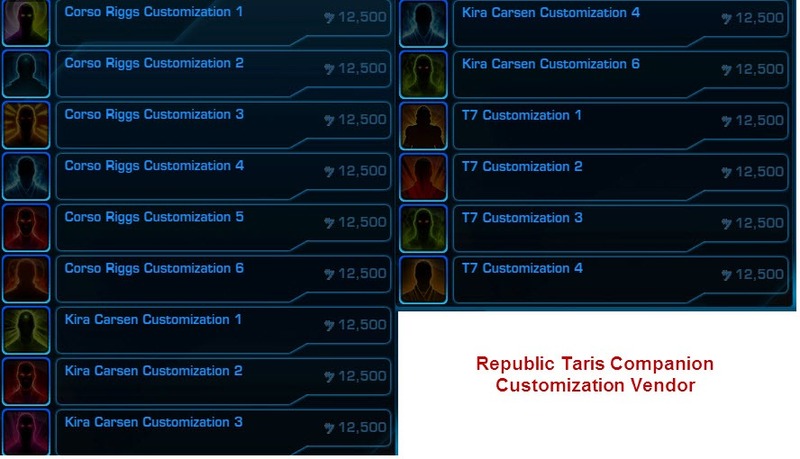 I wonder, if I have an Imperial character who is the only one I play KOTFE with, is there a way to get the customizations for the Republic companions like Aric or T7 that you recruit over the course of KOTFE? 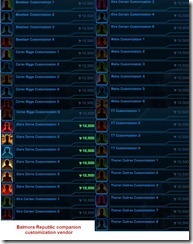 I tried logging in with my JK to buy the T7 customization I use and send it to my Imp Outlander, but the item is bound. 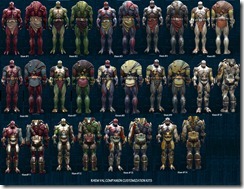 theres no way that i know of yet. 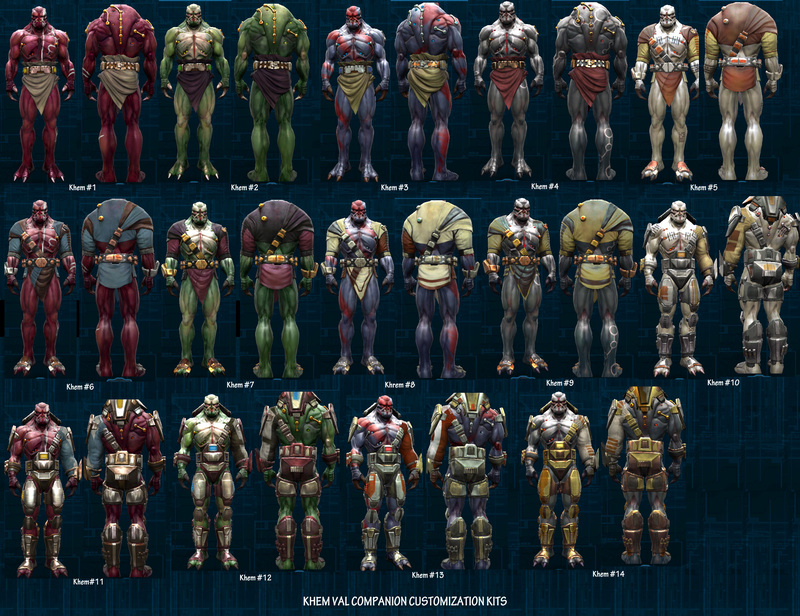 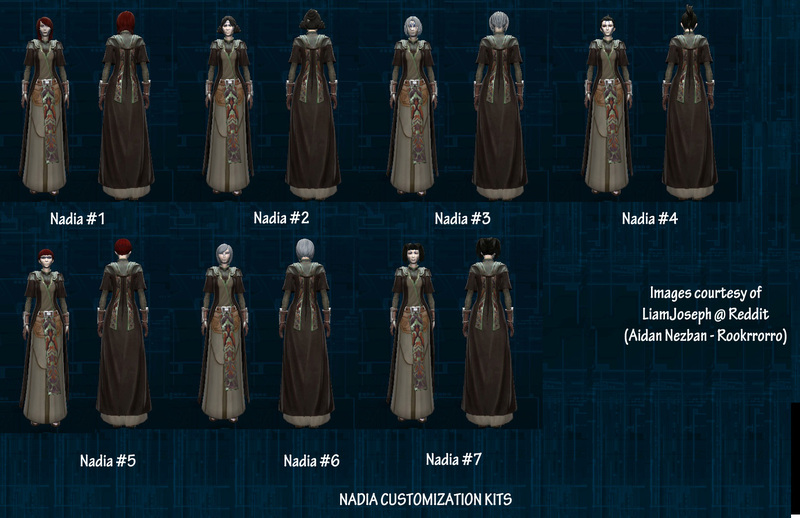 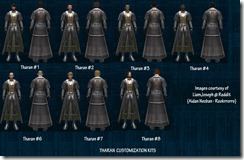 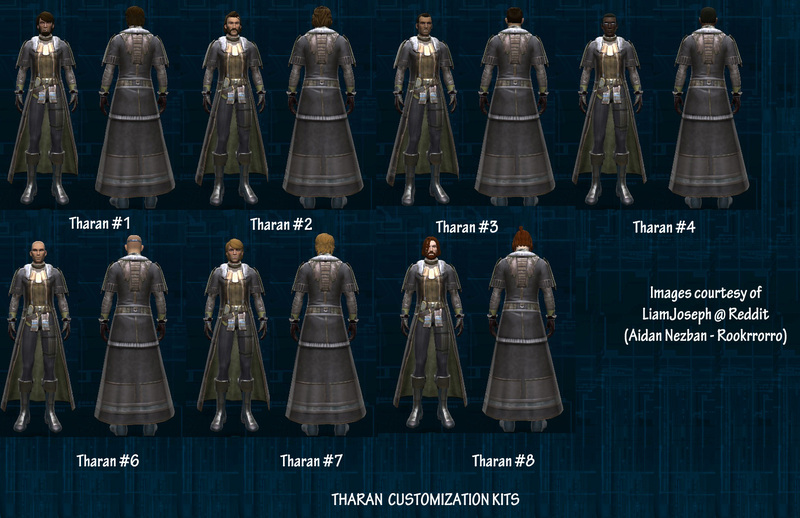 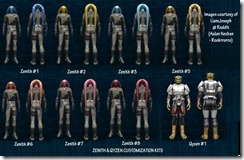 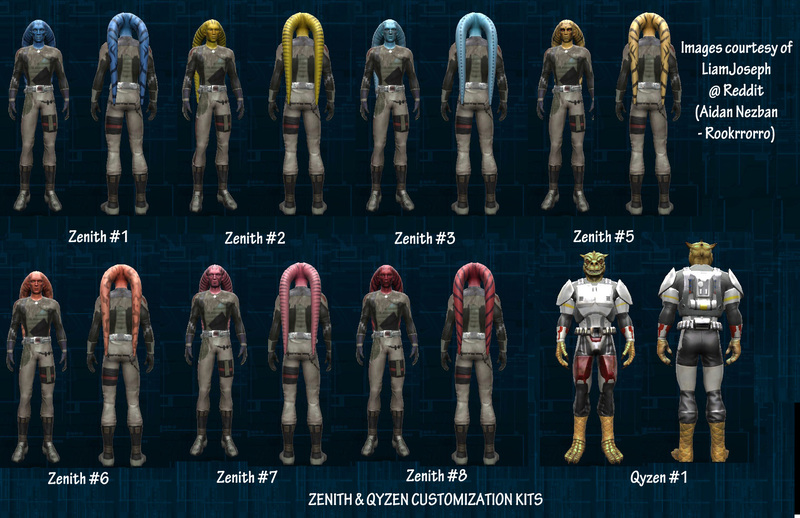 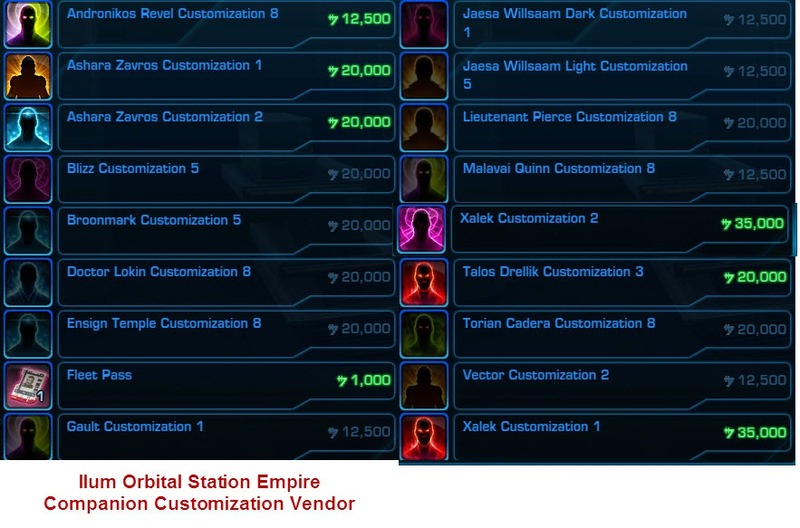 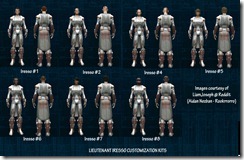 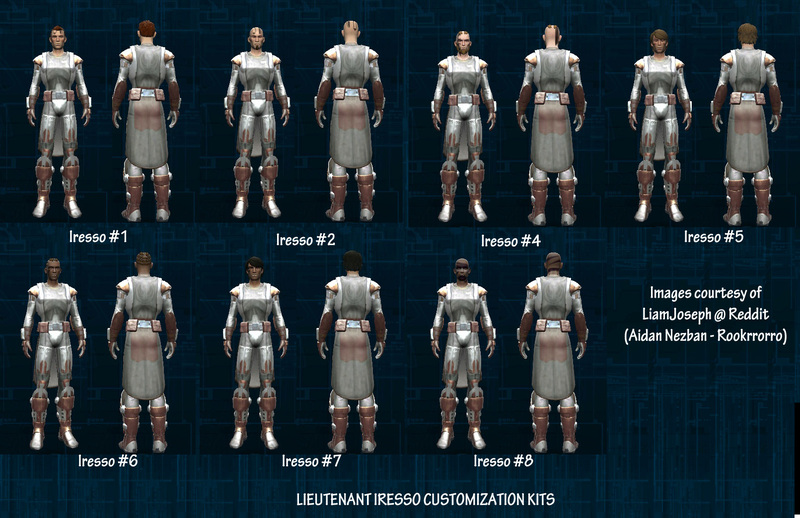 bunch of bs,, I want a yellow Qyzen Fess (customization 1) for my sith warrior, but dont know how to get it. 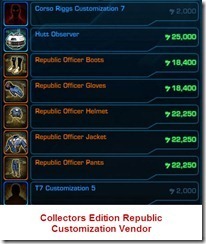 bop on republic side. 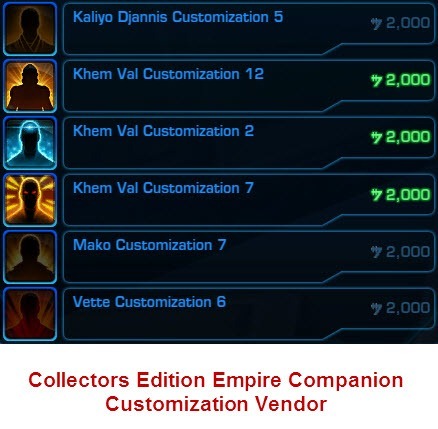 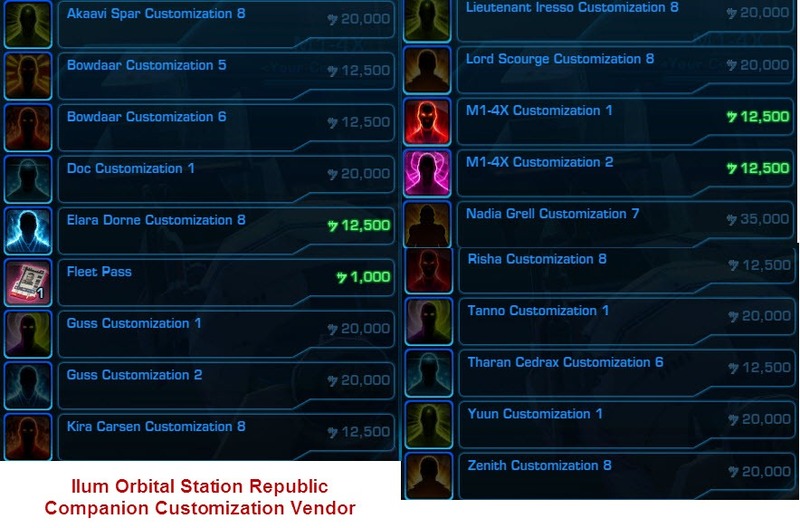 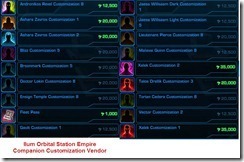 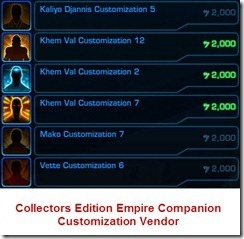 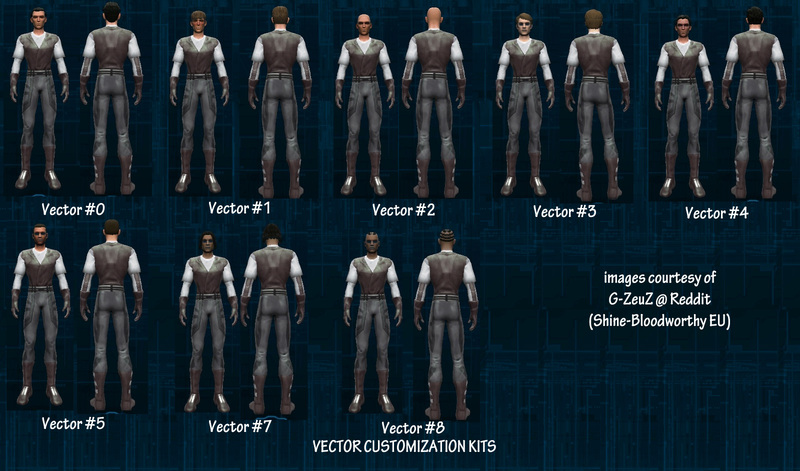 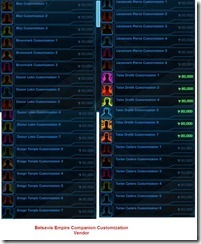 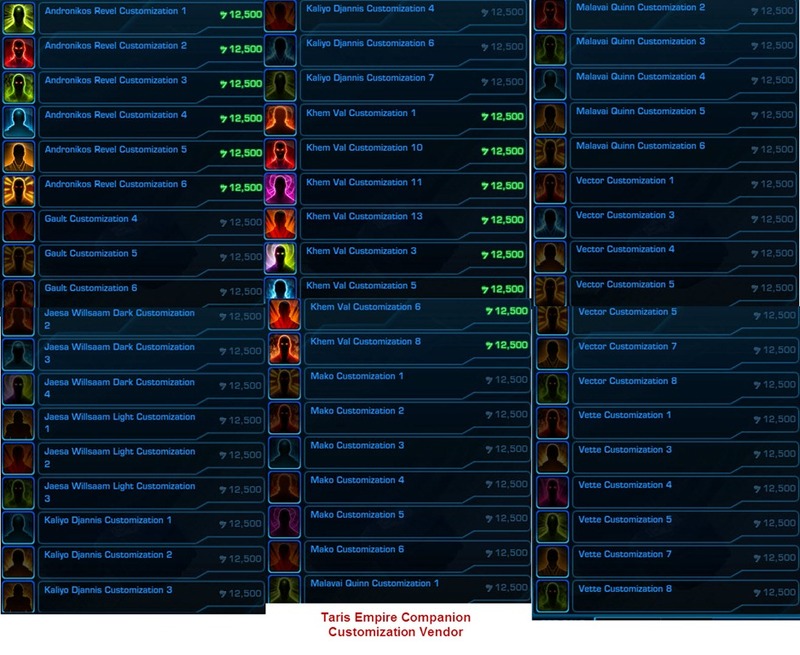 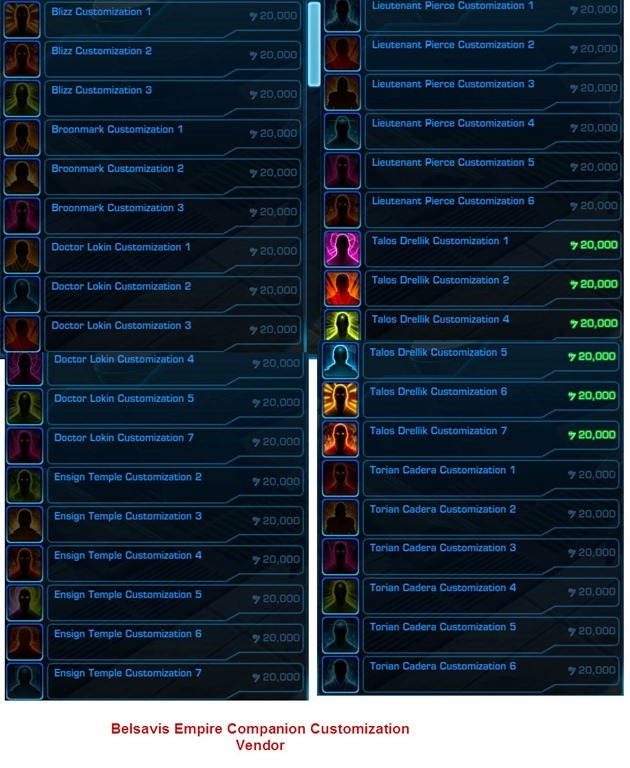 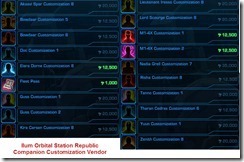 FYI, comp customizations for opposite faction comps can now be found in the Cartel Bazaar. 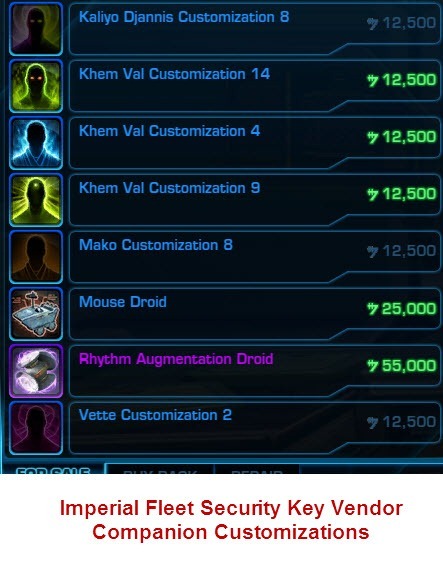 how do i buy those it wont let me do it? 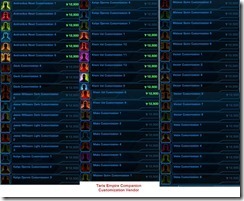 I imagine you have to have the comp in question unlocked from KotFE/ET.